Why don’t they come out?!? Should we ask the Police?!? No, there they are! 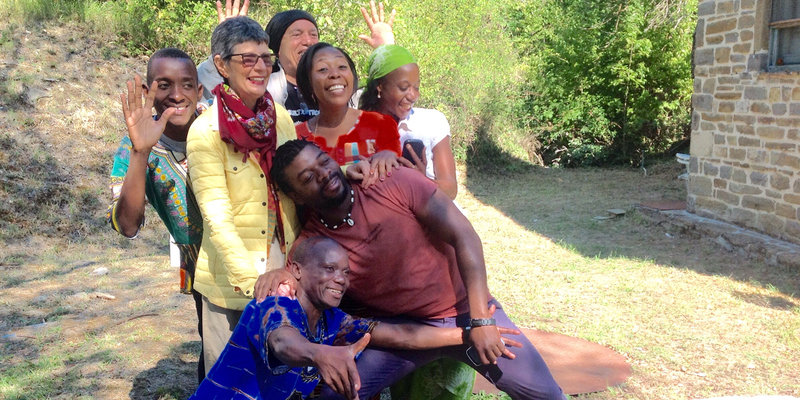 Fiumicino Airport in Rome, the magnificent 7 Mozambican actors, after a pause lasting a few weeks, have returned to Italy for the second part of their theatre training session to prepare “The fake doctor” by Ilteatrofabene. One of those bags, Agostinho’s I imagine, should have the Swahili translation of the script in it, Adelino (senior) should have all the props, Adelino (junior) should have the words of the final song. They smile, hug me, how happy I am that you’re here!!! Yes, I have missed these people! A lot! For days I thought about their way of living life, calmly (in Africa because of the heat) but above all how they enjoy themselves whenever they can. If you switch on some music, they move into pairs and dance. You chat, they laugh and joke. They always greet you with a smile, no matter whether it’s 6.30 in the morning or 11.30 at night. I asked how they were received at Palma after their return to Mozambique. Adelino (senior), laughing, said that there was a queue of people outside his house waiting to say hello. They have brought some capulanas (coloured fabric typical of Mozambique) as gifts for the girls who work in the kitchen and for Mamà, our Tiziana. They had travelled for almost 30 hours but we joked just the same, and try on the capulanas. Very intense evening, at 9 o’clock everyone was already in bed!